Hostmysite.com :: How do I enable Spam filters for my email account in SmarterMail? 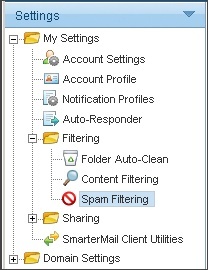 How do I enable Spam filters for my email account in SmarterMail? The following article explains how to enable Spam filtering for your mail account. SmarterMail includes many advanced anti-Spam measures that help keep out unwanted junk mail. There are three levels of Spam probability: low, medium and high. 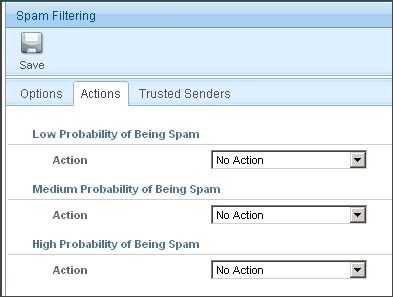 Customizing Spam settings flags certain messages for their level of Spam probability. The flagged messages are then handled according to specified actions for each level. From the left side bar, expand My Settings. Expand Filtering and click Spam Filtering. Select the radial button Override Spam settings for this account. 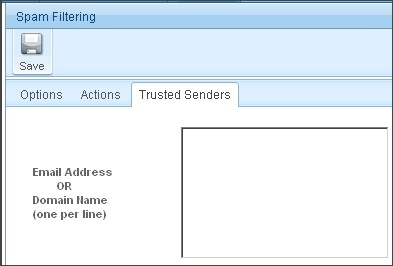 On the Trusted Senders tab, enter the email address(es) that will not be checked by the Spam filter.